The Neutrogena Naturals skin care range recently launched in Australia and includes five products ranging from facial cleansers, face/body bar and lip balm! 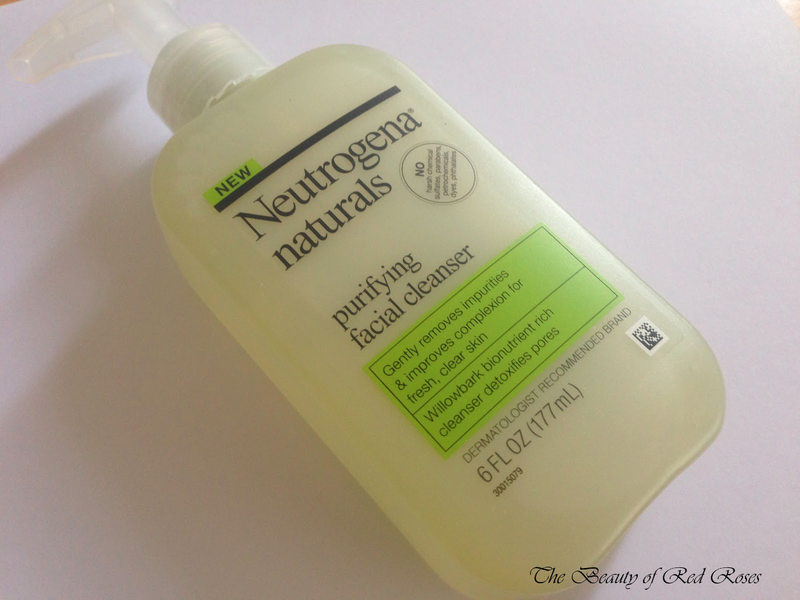 Cleansing the skin is one of the utmost important steps for clear and clean looking skin, so it's great to see that Neutrogena has come up with this new range so that we can achieve beautiful skin. 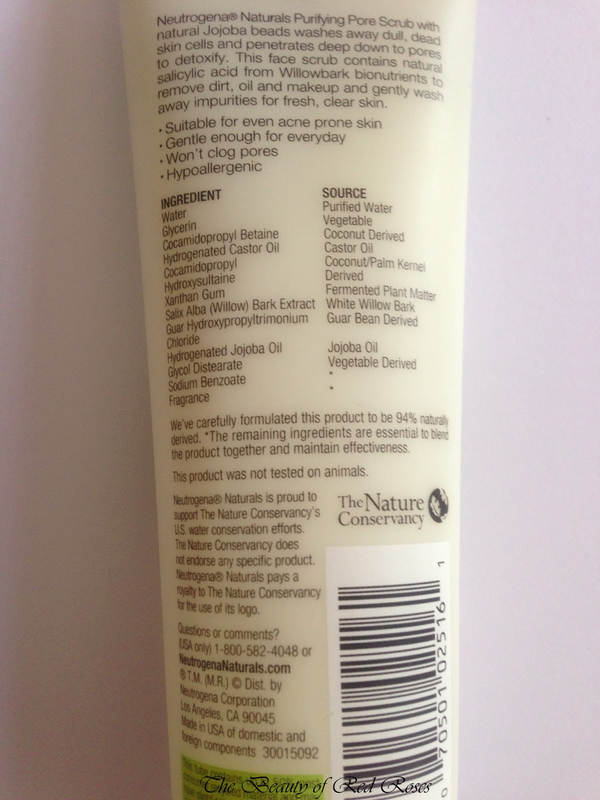 Approximately 94% of the products from the Neutrogena Naturals range are made from natural plant derived ingredients to provide effective results. Neutrogena Naturals products are pretty much free from harsh chemical sulfates, parabens, petrolatum, dyes and phthalates and are NOT tested on animals. The carton and bottle packaging is also made from an environmentally green approach as 50% of the packaging has been produced from recycled goods. The gorgeous Kristen Bell is the face of Neutrogena Naturals and what's not to love about her?! She is vegan, has an amazing personality and she has beautiful skin! A few weeks ago I received all five products from the Neutrogena Naturals skin care range to trial: Fresh Cleansing + Makeup Remover (A$14.99/177ml), Purifying Facial Cleanser (A$14.99/177ml), Purifying Pore Scrub (A$14.99/118g), Lip Balm (A$14.99/ g) and Face and Body Bar (A$4.99/99g). 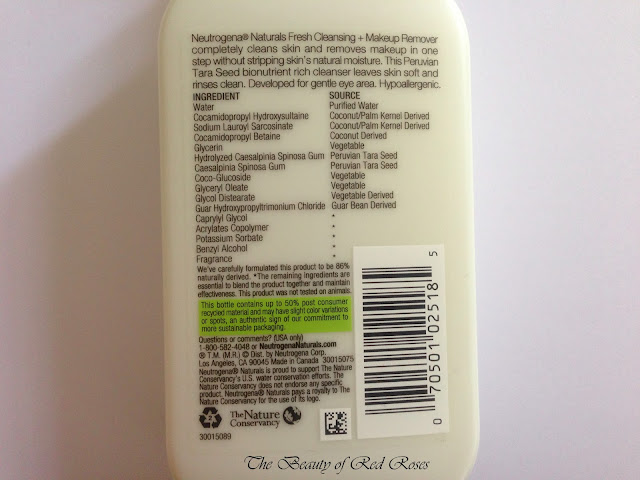 The recycled packaging of Neutrogena Naturals products is very simplistic and the pump dispenser of the two cleansers were very easy to use to dispense the desired amount of product. The ingredients list of each product is listed clearly on each packaging and the source in which the ingredient was derived from is also listed beside. I think this is a fantastic idea, as you would be able to know the origin of each key ingredient. 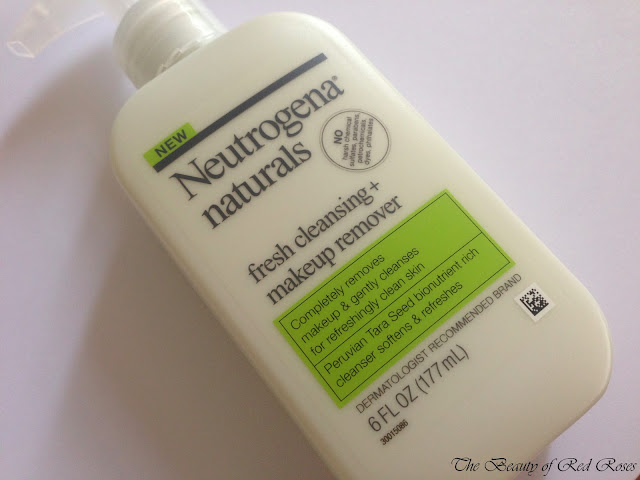 Neutrogena Naturals Fresh Cleansing + Makeup Remover is an opaque white gel cleanser which is a 2-in-1 formula that not only removes makeup, but also cleanses and nourishes the skin. Unlike most makeup removing facial products where you apply the product using a cotton pad, Neutrogena Naturals Fresh Cleansing + Makeup Remover should be applied directly onto the skin. The formula feels very gentle on my skin and removes residual makeup well. For the removal of heavy and waterproof eye makeup, I would recommend using a separate eye makeup remover product prior to using the Fresh Cleansing + Makeup Remover. The scent is quite lovely, reminiscent of sweet apples, so leaves my skin nicely and subtly scented. Neutrogena Naturals Purifying Facial Cleanser is a gentle translucent gel cleanser which contains salicylic acid to cleanse and detoxify the skin. I only need to use a couple of pearl sized amounts to cleanse my skin. The gel cleanser lathers up nicely and doesn't irritate, dry nor tighten my skin. Instead, my skin feels hydrated, smooth and soft to touch. My skin feels cleansed and revitalised, however, I would suggest to double cleanse by using the Fresh Cleansing + Makeup Remover first to ensure complete removal of residues on the skin. 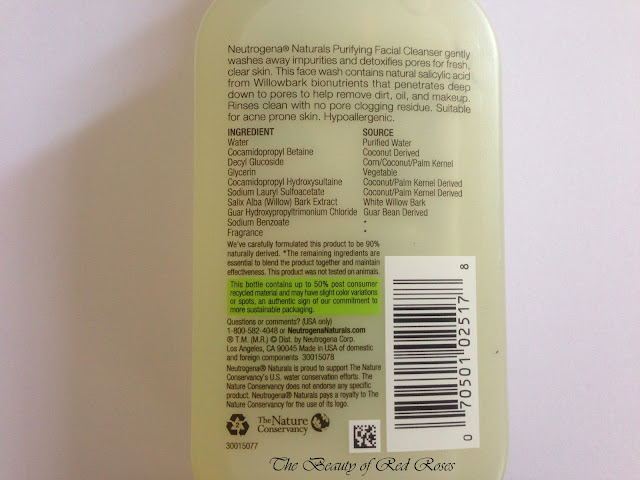 Purifying Facial Cleanser is great for my sensitive and combination/oily skin and the formulation of naturally derived ingredients makes this cleanser an excellent choice for cleansing the skin. 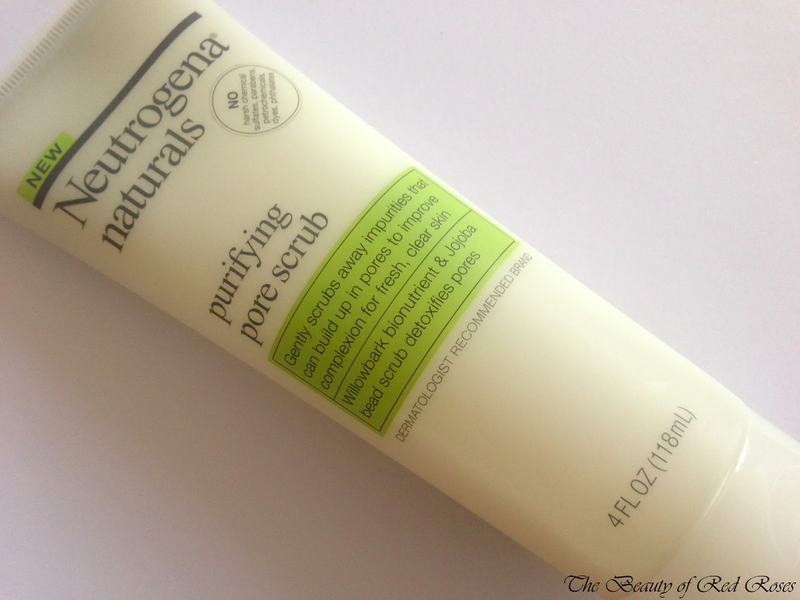 Neutrogena Naturals Purifying Pore Scrub is my favourite of the 5 products in the range as it consists of natural based Jojoba beads which are gentle enough to buff away dead skin cells and detoxify the pores. There were no instructions on usage, so in my opinion since the purifying Pore Scrub is so gentle to my skin, I've been using this scrub on a daily basis to ensure that my pores are thoroughly cleansed. The subtle sweet apple scent of this scrub makes me feel refreshed and I love how soft and smooth my skin feels afterwards. 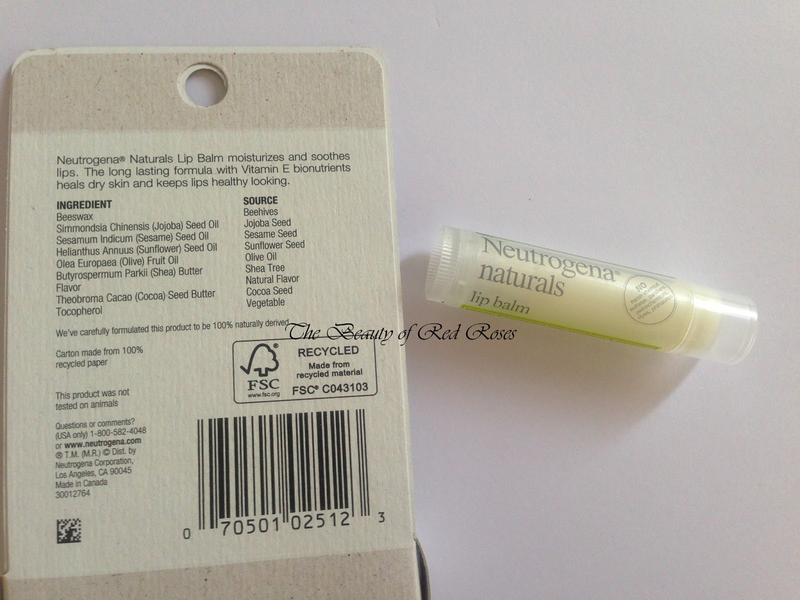 Neutrogena Naturals Lip Balm contains Beeswax, Cocoa Butter and Vitamin E to moisturise and condition the lips. The scent of this Lip Balm is subtle with hints of mint and apple. 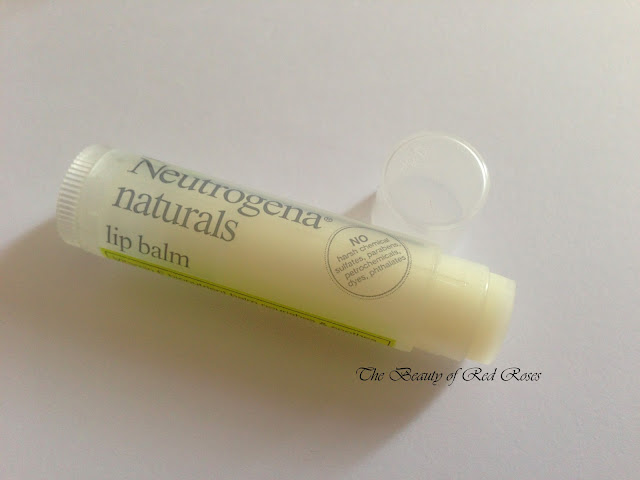 This Lip Balm hydrates and protects my lips very well and is even gentle on dry and chapped lips, however, it does not contain any sun protection factor which is one key criterion I look for in lip balms. Hence, I only use this Lip Balm in the evening, just before I go to bed to restore my lips. 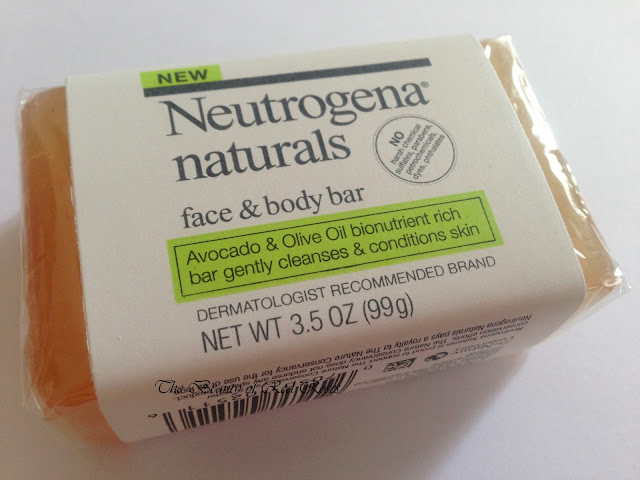 Neutrogena Naturals Face and Body Bar is made from 99% naturally derived ingredients and is very gentle to my skin. There was no distinct scent to this Face and Body bar, so an excellent product if you prefer fragrance-free soaps. 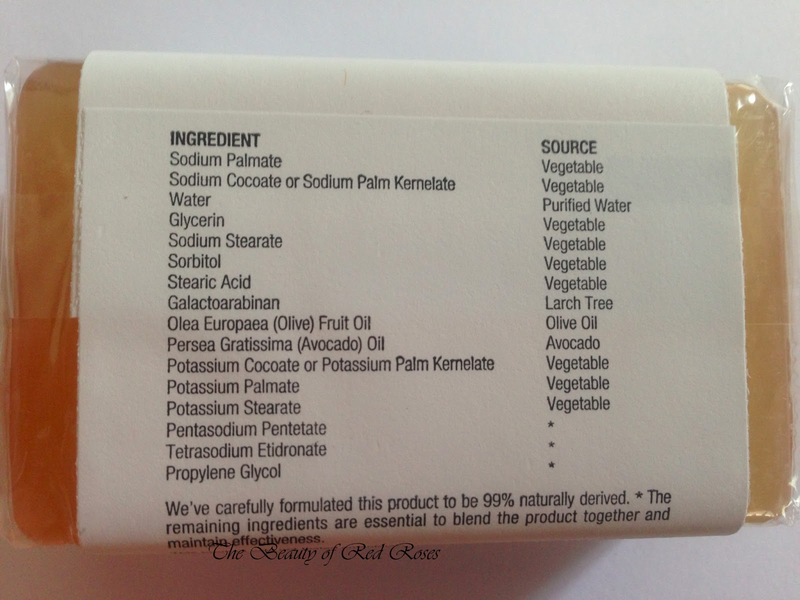 I prefer to use this bar for my body as I always opt for gel cleansers to cleanse my combination/oily face. This Face and Body Bar lasted a good 4 weeks and was effective in keeping my skin feeling fresh and clean thanks to the Olive and Avocado oils. My skin did not become irritated nor dry out after showering. The Neutrogena Naturals skin care range is a wonderful collection of ~94% natural-based facial/body products which is suitable for those who have sensitive skin. I really enjoyed using the products in conjunction with one another and loved how effective each product was to cleanse my skin/body and hydrate my lips. 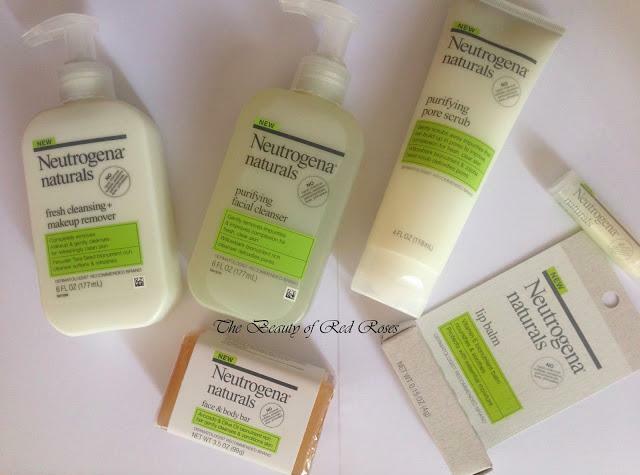 What do you think of the new Neutrogena Naturals skin care range? Products were provided for consideration only. This review is 100% based on my own thoughts and opinions. I am not affiliated with Neutrogena and did not receive remuneration to post this product review.